The Faerie Court of Fair LaPorte! Travis, The Collector! 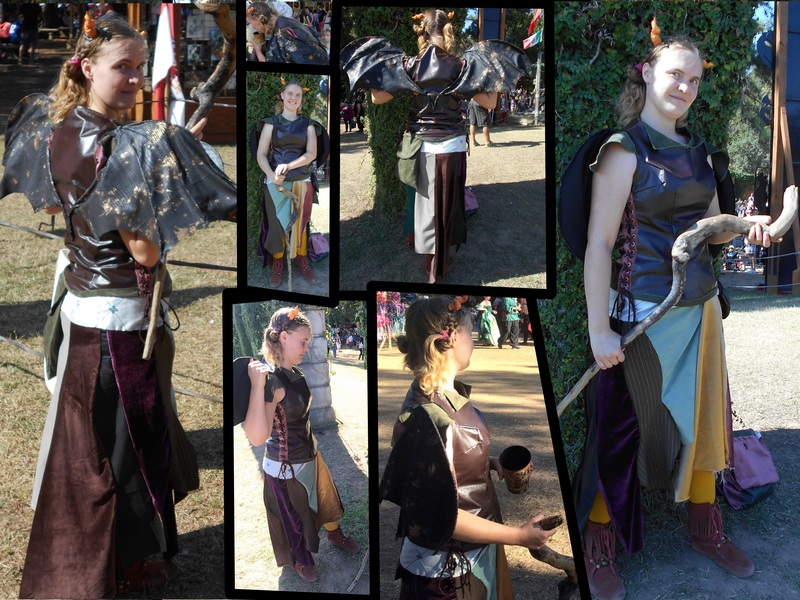 Costume design, construction, and photos by E.G.D. 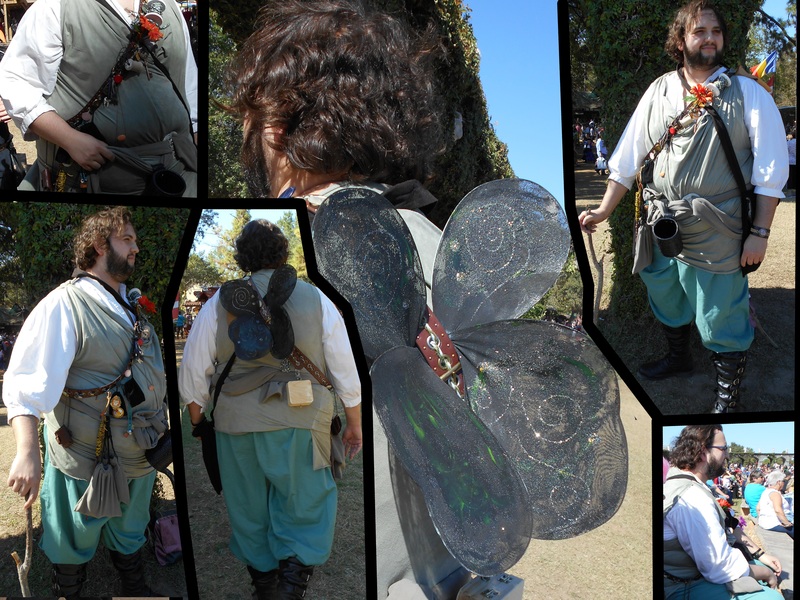 Travis, The Collector, is a faerie who collects lost things (subsequently using their power to his advantage). 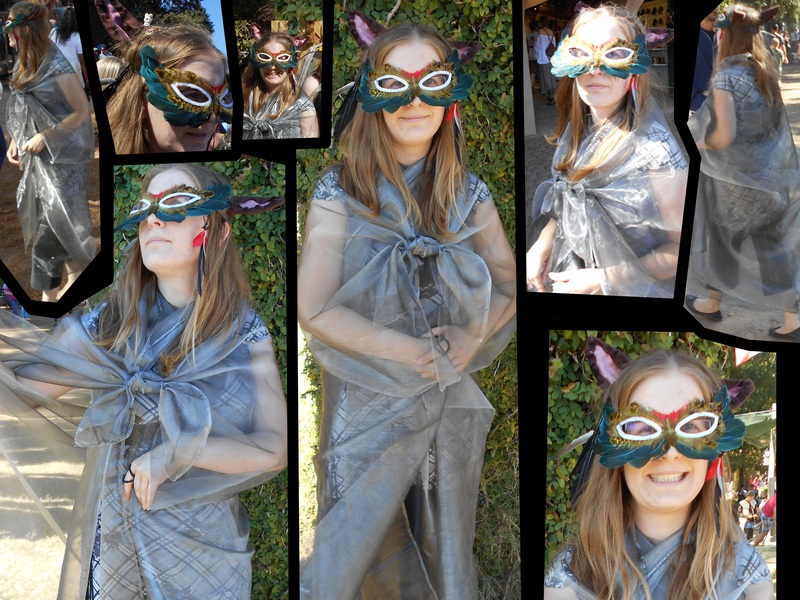 This costume, you might notice, has several bits pulled from previous years’ costumes. The bandoleer of collection bits is new, and very elaborate! The shirt and one of the pouches is also new. The under-shirt, pants, and boots are all items that Travis already had in his collection, the stick was a LaPorte found-on-the-ground affair, and the belt sash and several other pieces were pulled from Travis’ dragon rider courier costume. The wings are actually part of the bandoleer! Not only are they sparkly, I suspect they’re black-light reactive ^_^. Spike (on Liam)! Costume design, construction, and photography by E.G.D. Spike is a former tooth faerie who decided that all he really liked about teeth was that some of them were sharp, so he ran off with a bunch of pointy teeth then started to supplement his collection with sharp shells, claws, a very pointy dagger and other similarly sharp thingies. 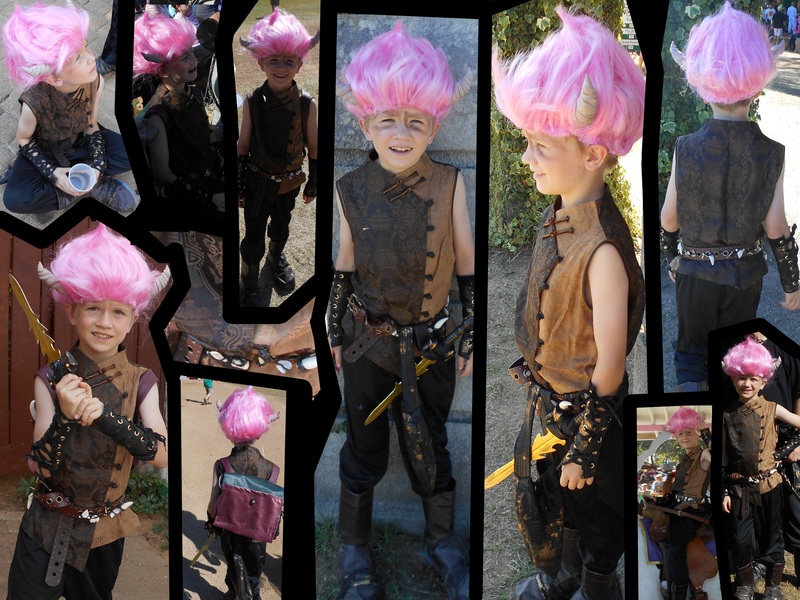 I crafted the horns using sculpey clay, and I made the wig out of a mid-back length pink wig that I cut into a bunch of pieces and re-worked using glue, a shamie rag, and the liberal application of heat (this works well when trying to get plastic to bend to your will). The belt is festooned with sharp objects, including a gold dagger (most silver-colored metals cause faeries harm!) that started out as my dragon rider dagger a couple years back. I re-embellished the piece and painted it gold for this year. The pouch, dagger strap, and gauntlets are made of the same material as Raggedy Anise’s wings (to be shown later in this post), and I used that same material to re-size Liam’s boot caps (originally from the ranger costume year. They were Oona’s boot caps for the Robbin Hood year, too, come to think of it) for his now much larger foot size. The shirt was a Good Will acquisition from long ago that a former roommate of mine left behind in our apartment when she left Honolulu. It’s Liam’s, now! Finally, the backpack contains the outer-wear I made for both kiddoes on our dragon rider year, and this year it was finally cold enough for both of them to need them when it got dark! I was glad they finally saw use, but they were quite the wrong color scheme for this year’s costumes 0_0. Ah, well. Daisy the Garden Faerie (on Oona). Costume design, construction, and photography by E.G.D. Daisy the Garden Faerie (Oona changed the name from the original, which was just plain ol’ “Daisy”) is a faerie who loves flowers and uses flowers in her magic! 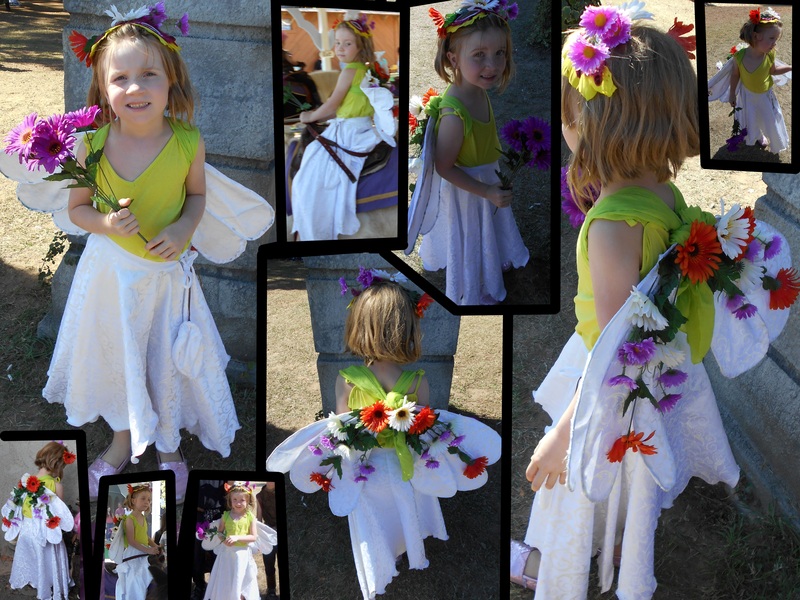 Her wings are daisy petals, and so is her skirt and her little purse (all made out of the same very stylish brocade). The headdress is actually a mask, but it wasn’t very practically sized for her little face, when all was said and done. It is made of feathers and plastic daisies (the same plastic daisies with which I embellished the wings). The green shirt and the scarf I used as her wing harness were both purchased at the 99 Cents Only Store in Atascocita. I was going for a flower-being-held-upside-down sort of look, with stem up top and flower drooping down. As a point of interest: I built the skirt so that it can be easily re-sized, and she should be able to wear it well into her teens, should she choose to do so. Spider Silk (on Kristie). Costume design, construction, and photography by E.G.D. Spider Silk, as you almost certainly already guessed, is a faerie with a strong spider affinity. 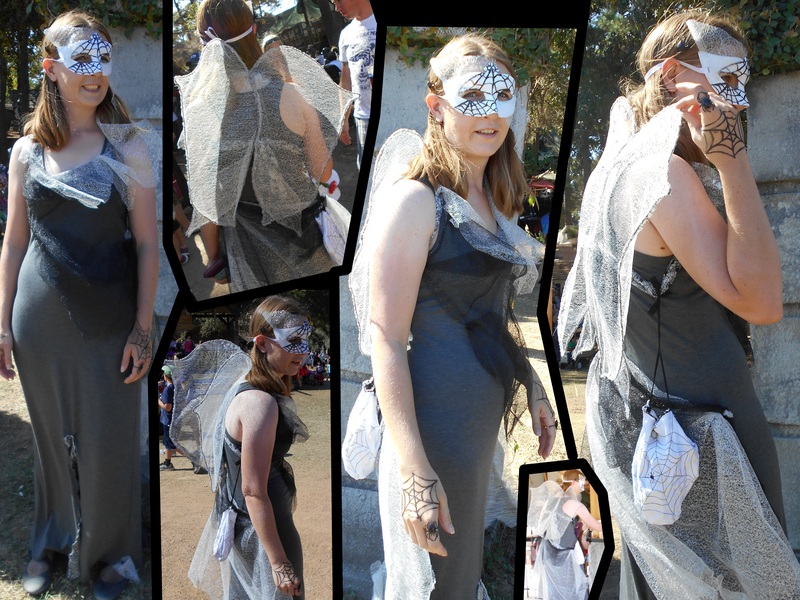 Her wings are delicate webs of silver, and her dress is draped and gathered with webs of silver and black. The dress also has silver-web inserts at the front and back that flare when she walks, showing off her web-looking fishnet stockings, but I somehow didn’t manage to get a picture that captured that feature well. I embellished the mask with that silver web and black paint, and she decorated the skin of her hands with black eyeliner webs. I embroidered the purse I built for this costume with a web design on both sides. If you look closely, there’s also a little spider ^_^. The harness for the wings is a spider and web patterned scarf I purchased at a halloween store, and the little gem spider rings that are decorating Spider Silk’s hand and hair were purchased at the same 99 Cents Only Store as Daisy’s shirt and scarf. Halloween season is very convenient for this sort of thing! Raven (on Ryan). Costume design, construction, and most of the photography by E.G.D. Several photos by Alaina Diehl. This faerie is pretty self explanatory! 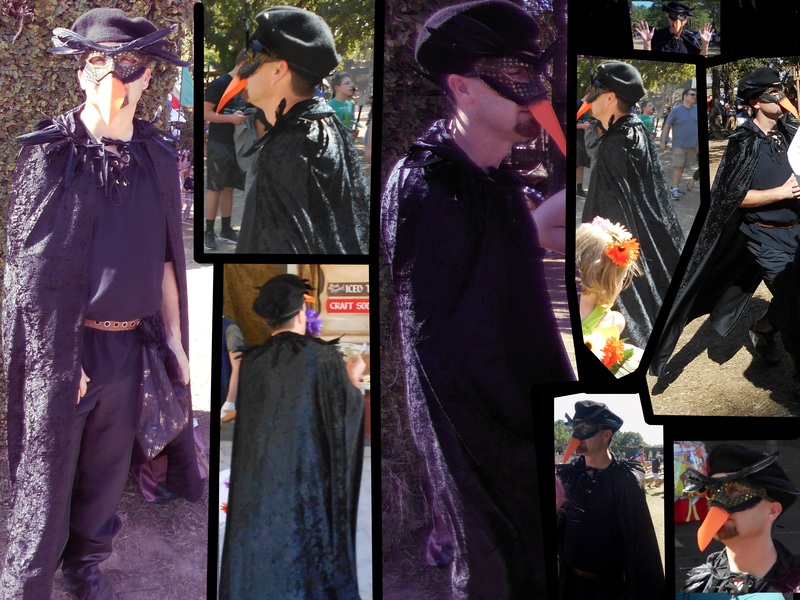 He’s a faerie raven or a raven faerie, or quite possibly both. The boot caps for this costume are actually the boot caps from I made for last year’s costume, but I bought some good, black acrylic paint and changed them from hunter green boot caps to black boot caps. The mask is made of plastic, sequins, paint, and foam-board with black goose feather accents. The cap is wool felt, and I purchased it on Amazon, subsequently re-shaping it a bit and adding a feather plume accent on the side. I altered a pre-made crushed velvet cape (intended for vampire costumes, according to the packaging!) so that the collar turned down over a bunch of willy-nilly protruding black goose feathers, and I turned a button up shirt into a lace-up shirt with scissors and a grommet machine. The belt-pouch, I made from the same material as Spike’s accessories and Raggedy Anise’s wings, with a feathery-looking faux-fur closing flap. I think Ryan wore it really well! Breeze (on Alaina). Costume design, construction, and photography by E.G.D. In several cultures, fox spirits have control of the sky and the weather, so Breeze has fuzzy fox ears (I used floral wire as a frame when I built the ears, so they’re fully pose-able) to compliment her feather hair ornaments and feathered mask . Otherwise, she basically wears the wind, which I represented with two shiny, translucent cloth drapes over a long shirt that features complimentary lines that suggest movement. Note: much like Raven, she does not have wings, but both she and Raven can most certainly fly! Raggedy Anise! Costume design and construction by E.G.D., and photography by F. Travis Riley. Raggedy Anise is the kind of faerie who is a mix of many things, most of them dangerous, though she is unlikely to harm you unless you do something to get on her bad side (of course, if we’re realistic about this, she’s a faerie, so that isn’t entirely difficult to do). I made the horns from sculpey clay and the wings from floral wire and sort of alligator-skin-ish pattern black and gold fabric. I designed the wings so that they can be either at rest or unfurled, and they provided some great sun shade during the hot part of the day! The cloth bits that make up the skirt are all from my scrap bin, and I left the raggedy and frayed edges at the bottom for that raggedy look. This is actually the third time I’ve revisited the bodice I used. 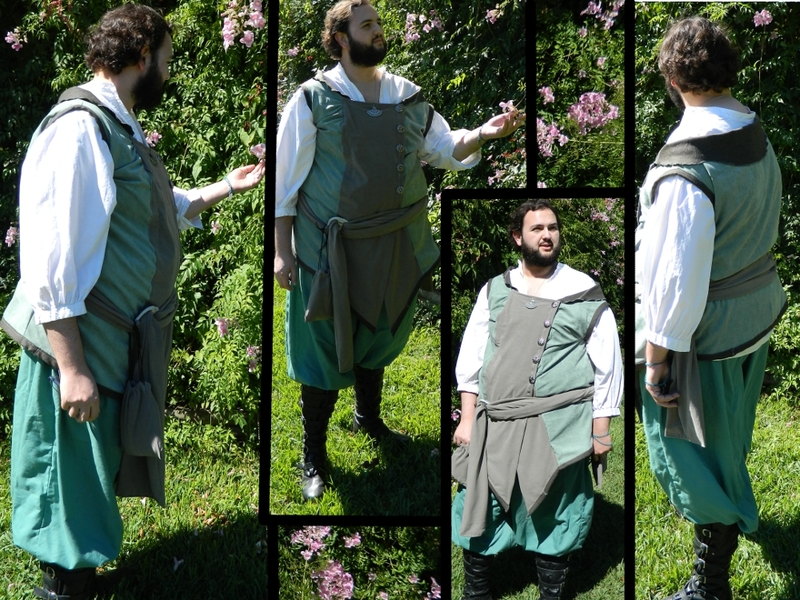 I built it for my ranger costume that first Ren Fest year (though I wore it for Halloween, not the actual Ren Fest, at which I wore my bard costume) and re-worked it for last year’s Robin Hood look. I left it in Robin Hood mode this year and simply added the wings and unfurling mechanism. The boots, I embellished for last year’s costume, but what makes them special to this year’s costume is that the McLin family dog chewed a great big hole in the back of one of them, and I had to patch it up! The fact that the boots are now old and very well-worn, as well as patched, made them ideal for this particular costume. Both the belt pouch and the purse are from last year’s costume, as well. What is probably the most special part of this costume is the walking stick, which I found on Sylvan Beach after a particularly violent storm earlier this year. Driftwood is just so darn cool, and it was a truly special find! It’s also surprisingly lightweight. So, there you have it! It’s nice that I can pull bits from previous years’ costumes, especially since Alaina moved to town and increased our number ^_^. It was a good year, and we all had a great time. We also looked really cool, right? What do you think the odds are that I can top these four years next year? 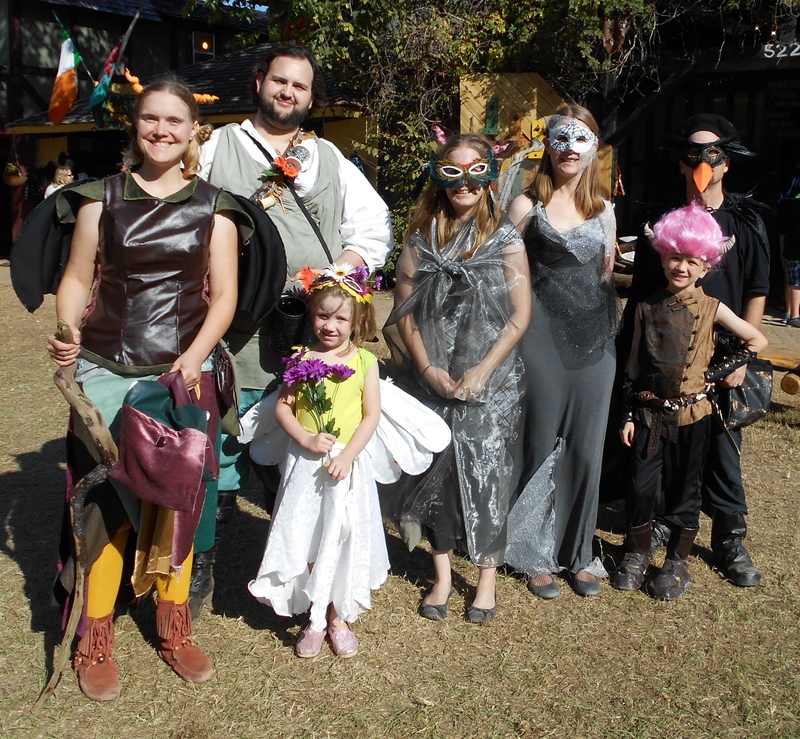 Join us next time for Ren Fest 2016, and find out! – E.G.D. ← San Jacinto College Central presents Spamalot! Love them all but Liam is an absolute hoot!